Course developers Dr. Lance Miller (Chicago Zoological Society — Brookfield Zoo and vice chair AZA Animal Welfare Committee) and Gary Priest (San Diego Zoo Global and member, AZA Animal Welfare Committee) are delighted to introduce the San Diego Zoo Global Academy's Animal Welfare course to you. While extremely difficult to measure, animal welfare is a science that allows us to determine where an individual animal's condition ranges on a continuum from good to poor. The course begins with a brief history of legislation pertaining to animal welfare and how animal welfare has been defined and evaluated historically. Animal Welfare emphasizes the importance of examining each individual animal, in addition to the resources available for its care, and the benefits that will result from focusing on an animal welfare plan from the perspectives of health, sustainability, and guest experience. The authors believe that this course will increase your understanding of animal welfare, as well as the best practices to help ensure high levels of welfare for the animals within our professional care. Click here to view a sample of the course. If you don't live in San Diego, you might be surprised to learn that virtually everyone in San Diego already knows Marty Levin. For the past 25 years, Marty Levin was the news anchor in San Diego for NBC. He was a frequent and welcome guest in our homes. With nearly 45 years in the field of radio and television production and journalism, Marty has learned a thing or two about how to share a good story with an audience. A combination of Marty's background, special skills, and talent intersected precisely with the Academy's need for a skilled narrator. We are pleased to announce that Marty Levin has agreed to narrate the Academy's new Animal Welfare module. We think you'll agree that Marty is a compelling storyteller and has a gift for crafting his narration in a way that adds a special, new, and dynamic ingredient to an important new Academy course. Click here to view a sample of the course, including samples of Marty's work. San Diego Zoo Global Academy Booth at AZA Conference in Salt Lake City! Please come by and see us at our booth at the upcoming AZA Conference in Salt Lake City. As always, we are very excited for the conference and the opportunity to talk with everyone about training for zoo and aquarium operations. 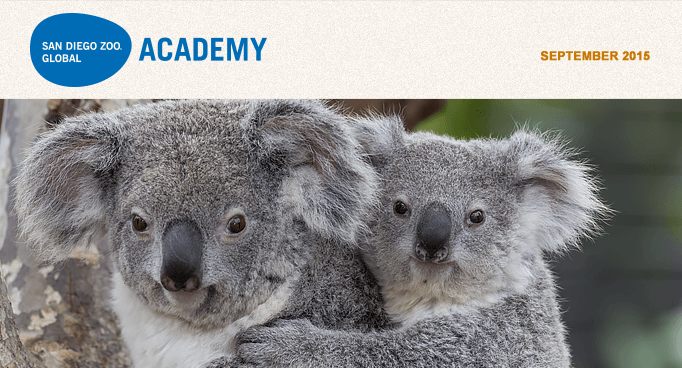 For more information on the Academy, please contact: Jon Prange, jprange@sandiegozoo.org. The Lee Richardson Zoo in Garden City, Kansas is now part of the Academy's collaborative learning environment. Welcome! The Academy catalog of online courses goes well beyond animal-care-related courses and interpretation training. Here is one of those other courses. Truly innovative leadership means fostering new thinking and collaboration that produces new business opportunities. It means building a capacity for innovative thinking and using it in concert with business thinking. This course teaches students about organizational leadership and its role in guiding the organization toward vision fulfillment. Students will learn how to define an organization's vision, draft a vision statement and communicate it, and set goals that are aligned with an organization's vision. If you have questions, please contact Julie Bittner at jbittner@cypherworx.com. To keep ahead, each one of us, no matter what our task, must search for new and better methods — for even that which we now do well must be done better tomorrow. Animal Welfare Act (AWA) compliance and zoological community professional accreditation are important contributors to progressively improving standards of animal welfare. Using the AWA and professional accreditation to constantly improve animal welfare is most effective when AWA-related processes lead to proactive practices, as part of an Excellence Beyond Compliance® program. This also aids in accreditation, as the cumulative impact produces an even better zoological organization by the time of re-accreditation. While previous columns have shown that working in concert is part of this effort, this column provides additional resources to make it work. In addition to the CEO, two other essential leaders should be: the AWA Compliance Officer (with the authority for maintaining continuous compliance) and the Animal Welfare Officer (heading up efforts toward enhancing animal welfare). Together, they are the core of the diverse, multidepartment Animal Welfare Leadership Group (some organizations use Animal Welfare Committee) that supports AWA compliance and animal welfare. Other representatives may include: animal curators; animal caregivers, including behavioral/husbandry/training staff; an attending veterinarian; buildings and grounds staff; maintenance staff; researchers; and other staff or volunteers, as appropriate (such as a safety officer, responsible for risk management and the safety program, and representatives from outside the organization, possibly including consultants, recognized experts, and independent members). Representatives of the Animal Welfare Leadership Group should accompany your APHIS Animal Care inspector during inspections. This group should be constantly preparing to improve inspection preparation and readiness through training and regular examination and evaluation of animals and facilities. Among other things, this group also reviews and ensures that experienced personnel update policies, protocols, and practices. Update on corrections to any prior noncompliant items, including making available any supporting materials for "self-certified compliance reporting"
Any areas or situations of particular interest or concern to the inspector (to be determined through discussion with the inspector either prior to or at the time of the entrance briefing). These are but a few of more than 100 items to incorporate into your AWA compliance and animal welfare efforts or comprehensive Excellence Beyond Compliance® program. Developed, refined and successfully executed for more than a quarter of a century, these practices really work. These practices also show your extraordinary commitment to animal well-being to the agency, the public, and even your own staff, volunteers, visitors, and supporters. © 2015 James F. Gesualdi, P.C. The opinions expressed herein are solely those of the author. This is not, nor should it be construed as, legal advice. Please email me at jfg@excellencebeyondcompliance.com to share the good you are doing (as only you can), or with any comments or questions on this column or suggestions for future ones. For more information on EXCELLENCE BEYOND COMPLIANCE® see the website. To order the ebook, click here. For upcoming workshops and sessions, contact info@excellencebeyondcompliance.com. The key concept is that multiple factors are often involved in the outbreak of disease in fish. Where the three circles overlap (see diagram) is the area leading to the development of disease. It is important to explore all potential contributing factors. We have already looked at the Host and Pathogen circle; this month, we look at the Environment. As aquarists, this is the main area over which you have control. When considering the environment, we must first consider: where in the world did these fish or other aquatic animals come from? The type of water is obviously critical—fresh versus marine, and if it is fresh water, is it soft or hard? (There are big differences, and we can look at them more closely another time.) We then attempt to replicate that environment as closely as possible. Generally, a poor environment, for whatever reason, will place the fish under stress. The physiology of stress in fish is exactly the same as it is in us and other mammals, leading to an increase in cortisol. This occurs via the hypothalamus, pituitary gland, and interrenal cells (the fish equivalent of adrenal glands). During last month's Academy webinar, I covered this in great detail. As with humans, cortisol causes immunosuppression, which can suddenly cause typically innocuous bacteria that are normally present in the environment to cause disease and even death. Next month, we will examine the environmental factors that can stress fish. Give some thought to this as you work with your displays in the weeks ahead. Make a list and compare it with my list next month. While water quality is definitely at the top of the list (and your list should include the parameters), there are several other important factors to consider as well. Snieszko, S.F. 1974. The effects of environmental stress on outbreaks of infectious diseases of fishes. J Fish Biol. 6, p. 197-208. The San Diego Zoo Global Academy is excited to share an additional Academy subscriber benefit regarding our collaboration with Dr. Jones: as an Academy subscriber, you are now entitled to a discount on the e-quarist™ courses. For more information about the SDZGA discount, contact katrina@theaquariumvet.com.au. Visit the Aquarium Vet website at www.theaquariumvet.com.au. The monthly webinars that Academy partner CypherWorx hosts are a good way for site administrators to stay current with upgrades and changes to the platform. Noted earlier in the newsletter, the next one is September 16. Another great way is to leverage the collaborative nature of the Academy community and share helpful hints with one another. Please don't hesitate to send a question my way! Have questions regarding the helpful hint? Ask Stephanie Crise, My Academy, at scrise@sandiegozoo.org. Make your staff members who supervise volunteers "honorary" volunteers by registering them in your volunteer eLearning site. By doing that, they can communicate and share information with the volunteers they supervise. It saves you from having to distribute information for them. The only thing you have to do is post resources for them, which is really easy. Have questions regarding the helpful hint? Ask Jean Galvin, the Brevard Zoo, at jgalvin@brevardzoo.org. Safety is the most important factor when lifting, lowering or moving a load with a forklift. This course will make participants aware of safety procedures in using a forklift to handle material. Subjects include hazards and risks of improper use, including common injuries. The course will teach participants how to teach safe lifting, about personal protective equipment and accident prevention, and will provide a safety checklist. The Academy's collaborative learning environment is already "hatching" innovative ideas: let's continue to make it easier to do so. You've got the ideas—let's collaborate on innovation! Please share your online training ideas at: sdzglobalacademy@sandiegozoo.org. Click here for the August 7 Zoo & Conservation News.